Challenging economic pressures has forced organizations to carefully reevaluate their IT strategies in an effort to reduce overall infrastructure cost. One particular area that is being scrutinized because of its significant licensing, maintenance and specialized support cost is that of business intelligence platforms. New with the release of Microsoft SQL Server 2008 are enhanced business intelligence features that provide a comprehensive BI platform that rivals the functionality of competing platforms for dramatically less cost. The new features and capabilities developed on top of one of the most pervasive database platforms in the world has made SQL Server 2008 a strategic alternative for BI platform consolidation. In addition, one main difference with Microsoft from other business BI providers is Microsoft's ability to push that BI out through a ubiquitous application in which users are already proficient - Excel 2007. This white paper outlines several reasons for consolidating BI platforms as well as outlining what's new with the release SQL Server 2008. Organizations of all sizes are looking more and more for ways to reduce costs while not sacrificing quality and effectiveness. 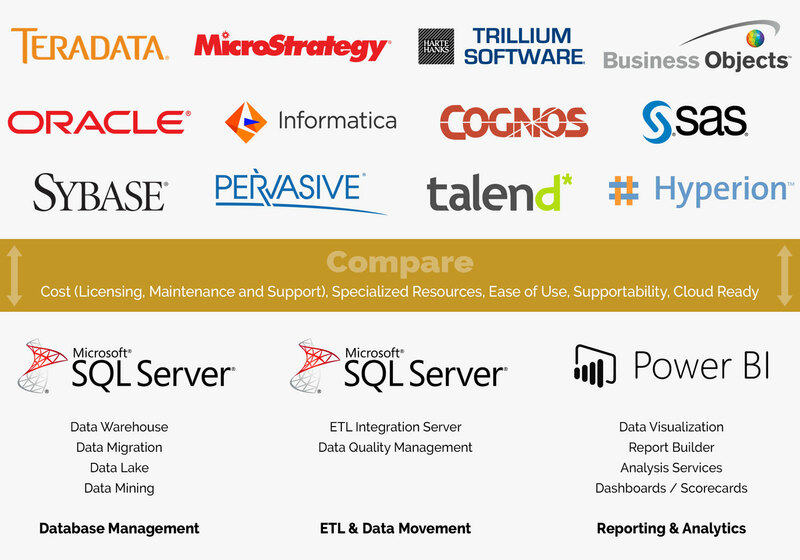 Perhaps the most compelling reason for BI platform consolidation is cost. Often, an organization can migrate their business intelligence applications to Microsoft's business intelligence platform (SQL Server 2008) for less than they are paying in annual maintenance and support for their current system. This doesn't even take into consideration the savings from reduced administration as well as specialized IT resources. For these reasons, Microsoft SQL Server used for BI platform consolidation provides a complete BI solution that provides a quick return on investment with ongoing cost savings. Cost savings alone are not the only motivation to consolidate platforms to Microsoft SQL Server 2008. The resulting landscape is more reliable and scalable, with less unplanned downtime. Even if your data is stored and managed in multiple external systems such SAP or Oracle, SQL 2008 can collect, perform quality checks and transform data into a common format that can be used for building ad-hoc or production reports as well as exporting to Excel. All of this is provided through a single platform that can reduce complexity and improve efficiency of information delivery. Gone are the days when, BI solutions were used by a group of business analysts. Today, organizations are realizing the benefits of extending the business insights that are available through BI to all employees within the organization and embedding those insights into the day-to-day operations of the business. SQL Server 2008 enables you to create a BI solution that can scale to thousands of users and deliver a rich user experience to everyone through an extensible, open and embeddable architecture that is optimized for interoperability with Microsoft Office 2007. Microsoft Office 2007 is an ever-present productivity suite that most information workers in organizations throughout the world use to perform their daily tasks. Through tightly coupled integration with Office 2007, SQL Server 2008 enables you to empower your employees with critical, timely business information that is tailored to their specific information needs. It will also result in saving time and money by using technology that works well together. The integration provides a quicker return on investment in terms of end-user by delivering business insight to everyone through familiar tools that are already likely to be installed on every desktop computer. Excel is the tool of choice for many financial and business analysis tasks, and is more likely than not already being used inside your organization. In fact Innovative Architects has found that many organizations have implemented costly BI platforms only to "export to Excel" to perform the actual data analysis. Start with the end in mind. SQL Server Analysis Services combined with the Data Mining Add-Ins for Excel 2007 will enable employees to go through the entire life cycle of a data mining project. This includes preparing data, building, evaluating, and managing mining models and predicting results by using either spreadsheet data or external data. SQL Server 2008 Highlights- What's New? SQL Server 2008 makes business intelligence available to everyone through deep integration with Microsoft Office, providing the right tool, to the right user, at the right price. Employees at all levels of an organization can see and help to influence the performance of the business by working with tools that are both easy to use and powerful. Combine SQL 2008 with Excel 2007's viewing and data mining capabilities and you have a complete, consolidated platform for delivering reports and business intelligence capabilities to your organization - all for likely much less than what you are currently spending on your BI. Innovative Architects has developed proprietary conversion accelerators that provide software automation for converting from point products such as Business Objects and Cognos to the Microsoft BI platform.